Oral submucous fibrosis (OSF) is a chronic fibrosing disease with a progressive and unrelenting clinical course that leads to mucosal stiffness and reduced mouth opening. Exposure to arecanut (Arecacatechu)  containing products with or without tobacco (ANCP/T) is currently believed to lead to OSF in individuals with genetic,  immunologic , or nutritional  predisposition to the disease. Commonly used ANCP/T consist of varying combinations of slaked lime (calcium hydroxide), betel leaf (Piper betle), catechu (extract of the Acacia catechu tree)  tobacco and flavoring agents. The ANCP/Ts are used as chews that are held in the mouth for varying amounts of time. The alkaloid content of the ground dried arecanut can reach 13.9 mg/g weight. Additionally, alkaloid additives such as slaked lime increase the mean salivary pH rapidly to 10. While, tobacco is often made alkaline by manufacturers to a level above 8.5 to facilitate better absorption of nicotine. , The ANCP/T contents cause a chemically induced increase in salivary pH that is augmented by the stimulated salivary secretion high in bicarbonate content. The increased salivary flow, however, helps in the return of salivary pH to normal levels by reducing the oral clearance time. The extent of the contribution of the ANCP/T produced stimulated salivary flow rate and oral clearance rate to the post chew rise in salivary pH and its subsequent recovery are unclear. However, it can be assumed that the habitual use of the ANCP/T will lead to an alkaline exposure of the oral mucosa for varying durations of time after every ANCP/T chew. The extensive research into pathological pathways and outcomes of OSF has not examined the correlation between the habit related alkaline exposure of mucosa and OSF. Based on the hypothesis that there is a habit-associated salivary pH changes in OSF, we conducted this cross-sectional study to examine the existence of a correlation between habit-related salivary changes and OSF in patients. The present ethically approved study was done in the Department of Oral and Maxillofacial Pathology and Microbiology after receiving informed consent from all selected individuals. Thirty individuals with clinically diagnosed OSF and 30 unaffected individuals all of who had current causative habits were identified for the study. All participants were counseled on the harmful effects of ANCP/T products and the need for regular checkups even after habit cessation. A further diagnostic intervention such as biopsy and treatment as required on a case to case basis was provided. General demographic information and habit details were recorded as reported by the subjects. Cumulative habit years were calculated from the sum of the duration of all habits. The daily exposure (minutes) was calculated by the product of the frequency and duration of each use [Table 1]. Where a range was provided, the lower value was considered. Individuals, who had given up the causative habits, were not included to prevent possible habit resumption. Most OSF patients who visit the dental hospital have given up the causative habits. Therefore, the majority of the cases in the study were identified at off-campus cancer screening camps. Individuals, who agreed to take part in the study were examined immediately for their convenience. Only subjects in need of additional intervention were asked to visit the hospital. Since repeated salivary pH estimation using a digital pH meter was not possible out of the dental college, it was decided to use universal pH paper for all cases. BLSpH was recorded for every subject after selection and data collection. Subjects were rested and had not used their habitual substance for a minimum of 2 hours. The salivary pH of participants in both groups was recorded immediately after chewing their habitual substance for 2 min and spitting the chew without rinsing. Subjects were asked to use their usual habitual substance in the routinely used quantity. The time taken for the PCSpH, to return to BLSpH or the recovery time was recorded in each subject. The PCSpH was checked every 5 min after chewing until it reached one unit above the baseline pH and subsequently once a minute until return to the baseline level. The recovery from an alkaline challenge depends on oral clearance rather than buffer activity. For this reason, the term salivary pH recovery was preferred in this study. Results were expressed as mean ± standard deviation and range for continuous data and percentages for categorical data. Pearson's correlation coefficient and Spearman's rank correlation assessed the relationship between different factors and outcome variables (pH changes and recovery time). Spearman's correlation was used to overcome the effect of outliers. The changes in the pH level were evaluated by one sample t-test. Differences were tested for significance by two-sample t-tests. For all the tests, two-tailed P ≤ 0.05 or less was considered for statistical significance. The 95% confidence interval (CI) was calculated for the mean group values and their differences. There were 27 males and 3 females in each group. The age range in the study (OSF) group was 21-80 years, whereas controls had an age range of 28-69 [Table 1]. All participants reported the use of arecanut in some form, except one 80-year-old male in the OSF group who used tobacco (smoking and chewing) without any arecanut. The mean cumulative habit duration was longer in controls (mean 19.40 years) than the OSF cases (mean 18.93 years). The average daily exposure, on the other hand, was longer in the cases (114 min/day) than controls (81.33 min/day) [Table 2]. There were no significant differences between the average BLSpH values of the controls (mean pH 7.03) and OSF (mean pH 7.17) cases [Table 3]. The mean PCSpH value in both groups was significantly higher (P < 0.0001) in comparison to the BLSpH. Mean PCSpH was more in cases (9.73 ± 0.98, 95% CI: 9.38-10.09) than controls (9.30 ± 0.99, 95% CI: 8.94-9.66) the difference was, however, insignificant [Table 3]. The average SpHRT was significantly (P = 0.0076) longer in the OSF (15.37 min) cases than controls with an average of 10.83 min. The mean difference between the groups was 4.54 min and the 95% CI: 1.19, 7.92 min [Table 3]. The analysis of the cumulative frequency of the SpHRT showed a faster incidence of recovery in the controls than OSF cases. The maximum difference in the incidence rate was observed 15 min after chewing, at which time the recovery to BLSpH was complete in 80% of the controls and 46.7% of the cases [Figure 1]. The time taken for salivary pH recovery was on average 41.92% longer in cases than controls. The Pearson's correlation coefficient demonstrated a statistically significant linear relationship with a strong positive predictive trend between PCSpH and recovery time in both controls [Figure 2] and OSF groups [Figure 3]. Rate of recovery of each unit rise of PCSpH was 3.07 min for OSF and 2.97 min for control subjects. Spearman's correlation (r s ) was run to determine the relationship between the independent and dependent variables [Table 4]. Age, BLSpH, average daily exposure, cumulative habit years and PCSpH (with SpHRT) were the independent variables and PCSpH and SpHRT were the dependent variables tested. The relation between daily exposure and cumulative habit years and PCSpH in cases was negative or inverse. All other relations examined showed a positive or reciprocal correlation. The strength and level of significance of the correlation varied between the OSF and control groups with the exception of BLSpH with SpHRT where the strength of the relationship was similar in both groups. 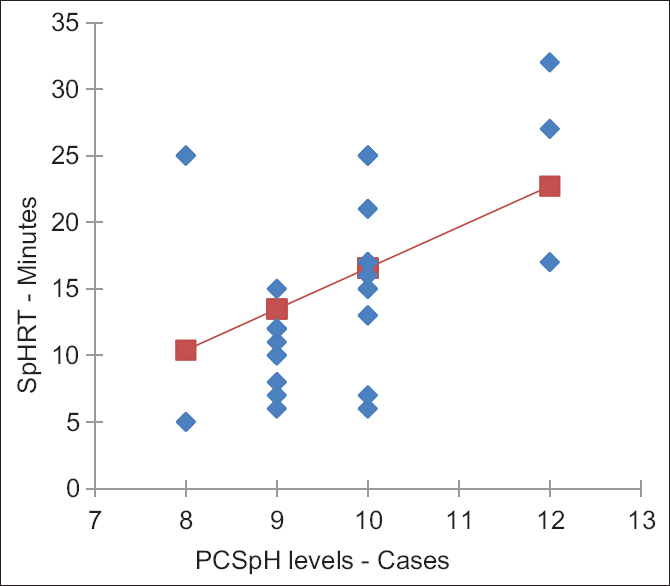 Among the variables tested the correlation values for daily exposure and PCSpH in controls (r s = 0.47, P = 0.008), age and SpHRT in cases (r s = 0.42, P = 0.02), PCSpH and SpHRT in controls (r s = 0.65, P = 0.0001) and cases (r s = 0.46, P = 0.01) were positive, strong and statistically significant [Table 4]. The novel findings of this study included an ANCP/T related PCSpH rise in all subjects and longer SpHRT with a slower rate of recovery in OSF patients, per unit increase in pH. Another note worthy finding was the difference in the salivary reaction of OSF patients and controls to chewing ANCP/T. There was no significant difference between the BLSpH levels of the controls (mean 7.03, 95% CI: 6.97, 7.10) and OSF cases (mean 7.17, 95% CI: 7.03, 7.30). These BLSpH levels were within the normal range of salivary pH 6.7-7.4  and most likely included the population mean values based on the narrow range and non-inclusion of zero in the 95% CIs. Thus, the average pH recorded for the groups by the universal pH paper in this study appears to be representative of the population. The PCSpH levels in the groups were significantly higher than base line levels (P < 0.0001), pointing to a uniform habit-associated rise in pH. 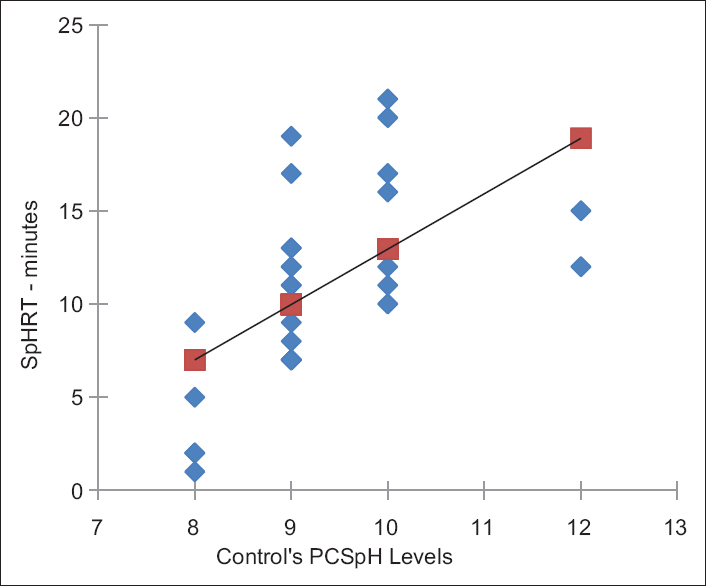 The average PCSpH level was higher in the OSF group than controls. However, the difference was not statistically significant, further supported by the inclusion of zero in the 95% CI range (−0.8-0.94) of the mean difference. The broad range of the CI may point to the lack of significance being caused by the limited sample size of the study. However, such an explanation seems unlikely since the 95% CIs of the individual groups did not include the value zero and had narrow ranges. None the less, the difference between the PCSpH values of OSF patients and controls needs to be further tested with larger samples. SpHRT was significantly longer in the OSF cases (P = 0.0076) than controls, with a mean difference of 4.54 min. The average recovery time was 41.92% longer and the rate of recovery per unit of pH was much slower in cases (3.07 min/unit) than controls (2.97 min/unit). Variations in SpHRT in this study where the protocol limited the variation in oral clearance by asking patients to spit after 2 min of chewing can be explained by the difference in the salivary flow rate. The difference may be caused by a physiological difference in the salivary flow rate of individuals. Rendering individuals with a lower rate of flow susceptible to OSF or it may be an outcome of the fibrotic changes seen in salivary glands of OSF patients leading to reduced salivary flow. The average age was higher in controls than OSF cases. This insignificant difference may have been introduced by the inclusion of individuals with minimum habit duration of 7 years in the control group while no such limit was set for the OSF cases. Average cumulative habit years were more in controls than cases while the daily exposure was more in cases than controls. While, no conclusions can be drawn from these insignificant differences; they highlight a possible difference in the effect of duration of habit and frequency of use in OSF and control cases. Comparing the extent and significance of the relationship between the dependent and independent variables in the groups showed differences in strength, direction and significance of the relations. 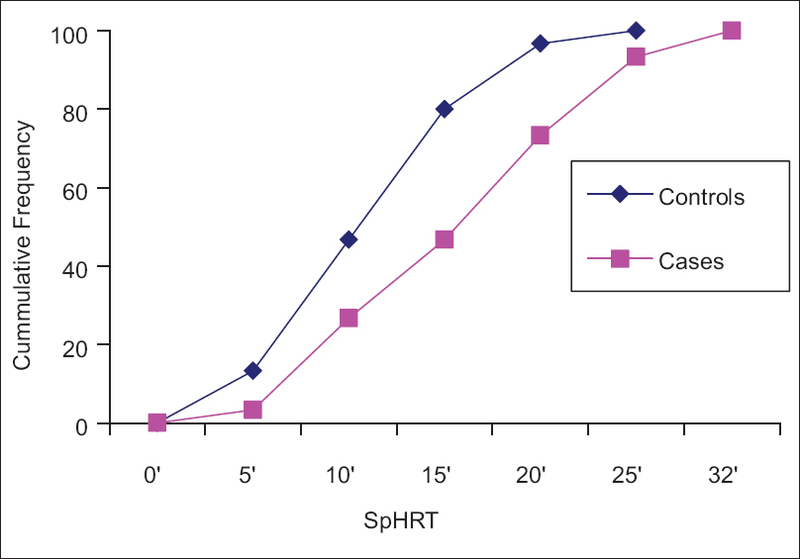 Age had a significant positive correlation with SpHRT in cases in comparison to a weak positive relationship in controls. The relation could be due to an age-related increased in the amount of stimulated salivary production;  and the resultant increased bicarbonate. OSF and control groups demonstrated a difference in the relationship of daily exposure and cumulative habit years with PCSpH and SpHRT. While the only significant relation was between daily exposure and PCSpH (rs = 0.47, P = 0.008) in controls, other differences were noted in direction and strength of the correlation. Daily exposure and cumulative habit years had a positive relationship with PCSpH in controls; the relation was negative in cases. The relationship between daily exposure and cumulative habit years and SpHRT was positive and insignificant in both groups. However, there was a reversal of degree of association between the groups. The relation between daily exposure and SpHRT was stronger in controls (r s = 0.35, P = 0.06) than cases (r s = 0.19, P = 0.32) while the relation between cumulative habit years and SpHRT was stronger in cases (r s = 0.31, P = 0.09) than controls (r s = 0.19, P = 0.31). SpHRT showed a substantial and highly significant relation with the PCSpH in both OSF patients (r s = 0.46, P = 0.01) and controls (r s = 0.65, P = 0.0001). The level of significance of the relationship was however much greater in the controls than cases. The differences between the significance levels, strengths and direction of the correlation between the variables tested could be due to differences in the manner in which OSF and control subjects react to the post chew changes in salivary pH. The insignificant differences may have been introduced by chance as a result of the limited sample size. Another interesting finding in this study was the 80-year-old male OSF patient, who reported smoking and chewing tobacco but no areca nut exposure. While this patient's PCSpH of eight and SpHRT of 25 min placed him out of the 95% CI range for the OSF group. The finding is notable and in agreement with previous reports of OSF occurrence in the absence of areca nut use. Currently, however, areca nut is considered to be an essential trigger for the development of OSF. The significance of this single OSF case without an areca nut related habit is unclear and needs to be further tested. To the best of our knowledge the present results are the first to illustrate a relation between habit related salivary pH changes and OSF, as such there were no available data for comparison of the findings. Future studies should examine the biological relevance of the salivary changes identified in this preliminary cross-sectional study in relation to OSF pathogenesis. Short comings in this study were the necessity of examining the patients in non- campus sites which resulted in the use of pH paper instead of a digital pH meter and non-inclusion of salivary flow rate estimation. The present study demonstrated a correlation between, habit-associated salivary pH changes and OSF. The nature of the association in terms of the salivary changes being a result or cause of OSF was not established due to the cross-sectional design of the study. This study showed a highly significant relation between the post chew SpHRT and OSF. Age, cumulative habit years, daily exposure, BLSpH and post chew salivary pH have different effects on post chew salivary pH and SpHRT in OSF patients and controls. ANCP/T products significantly raise the post chew salivary pH in all exposed individuals in comparison to their BLSpH. The role of habit related salivary changes in the causation of OSF and the difference in the salivary response of OSF patients and controls needs to be further studied. Ekanayaka R, Tilakratne W. Oral sub mucous fibrosis: Review on mechanisms of pathogenesis and malignant transformation. J Carcinog Mutagen 2013;S5-002 doi: 10.4172/2157-2518.S5-002. Chiu CJ, Chang ML, Chiang CP, Hahn LJ, Hsieh LL, Chen CJ. Interaction of collagen-related genes and susceptibility to betel quid-induced oral submucous fibrosis. Cancer Epidemiol Biomarkers Prev 2002;11:646-53. Rajendran R, Deepthi K, Nooh N, Anil S. A 4ß1 integrin-dependent cell sorting dictates T-cell recruitment in oral submucous fibrosis. J Oral Maxillofac Pathol 2011;15:272-7. Haque MF, Harris M, Meghji S, Speight PM. An immunohistochemical study of oral submucous fibrosis. J Oral Pathol Med 1997;26:75-82. Aziz SR. Oral submucous fibrosis: An unusual disease. JNJ Dent Assoc 1997;68:17-9. Weast R, Lide D, Astle M, Beyer W. CRCH and book of Chemistry and Physics, 1989-1990. Boca Raton, Florida: CRC Press; 1990. Thomas SJ, Mac Lennan R. Slaked lime and betel nut cancerin Papua New Guinea. Lancet 1992;340:577-8. Tilakaratne WM, Klinikowski MF, Saku T, Peters TJ, Warnakula suriya S. Oral submucous fibrosis: Review on a etiology and pathogenesis. Oral Oncol 2006;42:561-8. Available from: http://www.fda.gov/TobaccoProducts/Guidance Compliance Regulatory Information/ucm261847.htm_br. [Last accessed on 2015 Jan 05]. Dawes C. Factors influencing salivary flow rate and composition. In: Edgar WM, O′Mullane D, editors. Saliva and Oral Health. London: British Dental Association; 1996.p. 27-41. Mackenzie C, Mackenzie B, Beck P. The effect of pH on growth, protein synthesis, and lipid-rich particles of cultured mammalian cells. J Cell Biol 1961;9:141-56. Nanci A. Tencate′s Oral Histology Development, Structure and Function. 7 th ed. New Delhi: Mosby; 2008. Meghji S, Scutt A, Harvey W, Canniff JP. An in-vitro comparison of human fibroblasts from normal and oral submucous fibrosis tissue. Arch Oral Biol 1987;32:213-5. Kuo MY, Chen HM, Hahn LJ, Hsieh CC, Chiang CP. Collagen bio synthesis in human oral submucous fibrosis fibroblast cultures. J Dent Res 1995;74:1783-8. Shieh DH, Chiang LC, Shieh TY. Augmented mRNA expression of tissue inhibitor of metalloproteinase-1 in buccal mucosal fibroblasts by arecoline and safroleas a possible pathogenesis for oral submucous fibrosis. Oral Oncol 2003;39:728-35. Chang YC, Yang SF, Tai KW, Chou MY, Hsieh YS. Increased tissue inhibitor of metalloproteinase-1 expression and inhibition of gelatinase Aactivity in buccal mucosal fibroblasts by arecoline as possible mechanisms for oral submucous fibrosis. Oral Oncol 2002;38:195-200. Schultz G, Mozingo D, Romanelli M, Claxton K. Wound healing and TIME; new concepts and scientific applications. Wound Repair Regen 2005;134 Suppl: S1-11. Greener B, Hughes AA, Bannister NP, Douglass J. Proteases and pH in chronic wounds. J Wound Care 2005;14:59-61. Fasciglione GF, Marini S, D′Alessio S, Politi V, Coletta M. pH-and temperature-dependence of functional modulation in metalloproteinases. A comparison between neutrophil collagenase and gelatinases A and B. Biophys J 2000;79:2138-49. Wang S, Mc Donnell EH, Sedor FA, Toffaletti JG. pH effects on measurements of ionized calcium and ionized magnesium in blood. Arch Pathol Lab Med 2002;126:947-50. Lin HJ, Lin JC. Treatment of oral submucous fibrosis by collagenase: Effects on oral opening and eating function. Oral Dis 2007;13:407-13. Utsunomiya H, Tilakaratne WM, Oshiro K, Maruyama S, Suzuki M, Ida-Yonemochi H, e tal. Extra cellular matrix remodeling in oral submucous fibrosis: Its stage-specific modes revealed by immunohistochemistry and in situ hybridization. J Oral Pathol Med 2005;34:498-507. Sirsat SM, Pindborg JJ. Sub-epithelial changes in oral submucous fibrosis. Acta Pathol Microbiol Scand 1967;70:161-73. Cox R. Chemical Burns; 2013. Availablefrom: http://www.emedicine.medscape.com/article/769336-overview. Sirsat SM, Kandarkar S V. Histological changes in the oral mucosa of the wistar rat treated with commercial lime (calcium hydroxide)-An optical and sub-microscopic study. Br J Cancer 1968;22:303-15. Prabhu S. Oral Diseases in the Tropics. Oxford: Oxford University Press; 1992. Ranganathan K, Devi MU, Joshua E, Kirankumar K, Saraswathi TR. 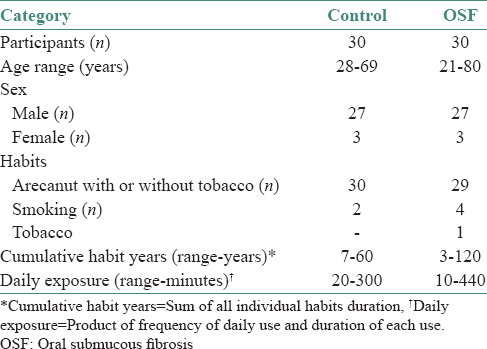 Oral submucous fibrosis: A case-control study in Chennai, South India. J Oral Pathol Med 2004;33:274-7. Seedat HA, van Wyk CW. Sub mucous fibrosis in non-betel nut chewing subjects. J Biol Buccale 1988;16:3-6.